Hi, my name is Holley and I'm a Coke addict. That's Coca-Cola, or "Co-Cola" as we say in the South. I go straight for the hard stuff too, avoiding any of the wimpy Diet varieties. In my defense, I think I'm genetically predisposed. As a young child, I remember hearing tales of my dad drinking a Coke and eating a Hershey bar for breakfast when he was a summer "work boy" at Camp McDowell. I had a pretty extreme habit going for many years, probably ingesting no less than 64 ounces on a daily basis. As a non-coffee drinker (one of the handful in the world, I feel), Coke was my substitute. Sure I got my caffeine fix, but I actually liked the flavor. I also have wonderful childhood memories of the world's most popular beverage. I remember moving to Panama when I was four years old. I was pretty down on it, thinking we were going to live in a primitive hut surrounded by lions. Hey, I was only four and a frequent viewer of Mutual of Omaha's Wild Kingdom and my parent's National Geographics. But my tune changed when my parents told me I could get a pet monkey. I had it all planned out: I made us matching fishing rods (don't ask), selected the most transferrable doll clothes, and found a basket large enough to serve as his/her bed. We were going to be best friends and live happily ever after in our hut in the jungle. Well, they totally reneged on that promise when we arrived. I think their story was that the government just changed the rules and you could no longer have a pet monkey (but if you already had one, you could keep it). I was pretty bummed but at least we were living in a house with electricity and plumbing. In fact, I managed to find some solace in the small green glass bottles filled with caramel-colored, sugary, fizzy water that were delivered to our house on a weekly basis. That's right, we had a Coke Man! He became my new BFF, although he was not interested in my homemade fishing pole. It was awesome until my brother and I went to the dentist for the first time and he declared our teeth were rotting. Mom cracked down pretty hard on the quantity we could drink, but I was already hooked by then. My granddad was also a great lover of Coke. We had a ritual. He'd say, "Go grab yo'self a cold Co-cola and come out here and sit a while." We'd take our perch on the front porch and just talk and watch the world go by. We might even chase it with a chunk of sugar cane he grew. And when the garbage men or mailman would come by, he'd always offer them one. They almost always accepted. I've often wondered if it was out of courtesy or because of the overbearing humidity. There's nothing like an ice cold Coke to quench your thirst on a hot day. I've tried repeatedly to curb my Coke habit in recent years. I'm better. I may go four or five weeks without one, only to weaken and grab one at the gas station while I'm filling up my car. But somewhere along the way, Coke changed on me. The glass bottle was abandoned for plastic and "they" changed the secret formula. I'm not talking about the failed New Coke launch. [I hope that guy was fired.] I mean they started using high fructose corn syrup instead of cane sugar. Like I said, I'm an addict so a not-as-good-Coke was still better than no Coke. But recently I heard some fantastic news: Mexican Coke is still made with sugar! A burgeoning gray-market for Mexican Coke has emerged in recent years, which is a beverage bonanza for discriminating Coke addicts (like myself), Mexican immigrants, and green and gourmet consumers. Mexican markets and taquerias are popular vendors, and, lucky for me, the Santa Barbara area has plenty. Since I had to get out of my house for a few hours today while some work was being done on it, I thought it was a great excuse to do some investigative research. I started on Milpas Street but surprisingly came up empty-handed at least a dozen times. 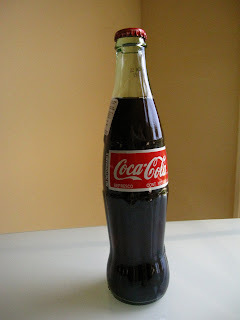 Most had Coke in a glass bottle but none were imported from Mexico. Feeling discouraged but not hopeless, I decided to move my research project south to Carpinteria. At about my fifth stop, I struck gold! I almost dropped the bottle when I saw the words "Hecho en Mexico" on the label. To confirm my discovery, I turned the bottle around to look at the ingredients and sure enough it listed "azucar!" I marched up to the counter and plunked down three bottles. Upon request, the cashier opened one for me. I sat down on the bench outside, admired the worn hand-me-down bottle and took my first sip. It was a rapturous experience. I found myself saying, "I remember that taste," and I was instantly transported to my granddad's front porch once again. It was all I could do to restrain myself from downing the two remaining bottles right then. Despite the fact that Coca-Cola Corporate in Atlanta claims there is no noticeable difference in taste between the Mexican and the U.S. version, let me tell you there is. It has a cleaner sweetness to it. Diet Coke drinkers often make a face when they see me take a swig of my Coke, saying they can't handle the sugary aftertaste. I think it's because they've only had Corn Syrup Coke, which I admit does have a cloying sweetness and leaves a film in your mouth. 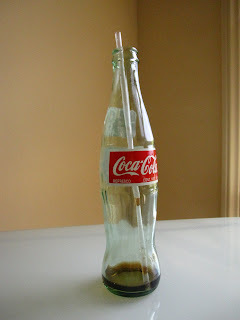 Mexican Coke is also fizzier and colder because of the glass bottle. So I think the time has come for me to bid thee farewell, Corn Syrup Coke, and your second-rate sweetness. From now on, I'm holding out for the REAL Real Thing. If you're ever in the LA area, check out Galco's Soda Pop Stop. They have a ton of real sugar sodas, including the elusive coke. Watch out though, because I think the label on the MexiCoke version has lead in it (there's a lead warning on the back if I remember correctly). No, I don't work for Galco's - I just hate HFC.